Watch the video of Professor Patrick Bouic below to get an in-depth perspective on how buchu works as an anti-inflammatory. Galley P, Thiollet M. Pubmed: 8376915; Mar 1993;12(1):69-72. 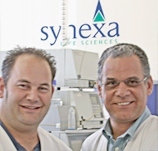 Wessel Kriek and Prof. Patrick Bouic at Synexa Life Sciences researching the wonders of buchu during a lab session in 2008. Reduction of chronic pain. Reduction of inflammation. Use in Arthritis, Rheumatism and any other joint destroying process. Use in cases of cystitis, prostatitis, pyelonephritis. Prevention of swelling and bruising. Diosmin has shown to help strenthen blood vessels and prevent four different types of bruising. 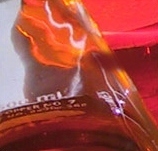 Diosmin is one of the main components in Buchu. The toxicity of Agathosma betulina and Agathosma crenulata was evaluated by Moolla and Viljoen. The extracts of Agathosma betulina and Agathosma crenulata were not toxic at the concentrations tested.